September 3, 1862 – Washington, D.C. The 8th arrives at Washington, DC and makes camp on the grounds of the White House near the Washington Monument. [i] Washington is still buzzing from the belief that General Lee will soon attack the capital with his forces now believed to be massing to the south. However, Lee has other plans for his army. On this very day, the commander of the Army of Northern Virginia has written a letter to President Jefferson Davis informing him that the army is beginning to move to the west and contemplating a movement over the Potomac unless there is objection from the President. Lee has built a force of 55,000 soldiers organized into two corps under Jackson and Longstreet while McClellan has been named to organize the defense of Washington for the Union. 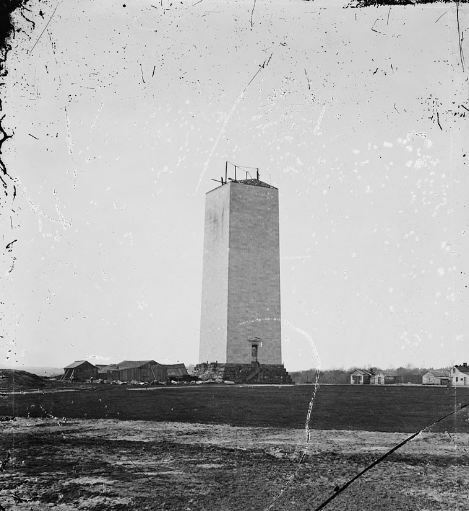 The unfinished Washington Monument during the Civil War. The 8th CVI camped on this ground September 3-7, 1862.